PaleoGIS is an extension to ArcGIS from Esri which enables geoscientists, GIS professionals and academics to incorporate geologic time into their GIS. 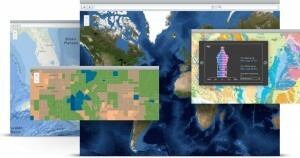 With PaleoGIS, users visualize their own data in a plate tectonics and paleographic context. Esri’s ArcGIS is a geographic information system (GIS) for working with maps and geographic information. It is used for: creating and using maps; compiling geographic data; analyzing mapped information; sharing and discovering geographic information; using maps and geographic information in a range of applications; and managing geographic information in a database. More specifically, PaleoGIS is an extension to the ArcMap component of the ArcGIS suite.